Here we go again for another round of Jamie Easons Live Fit Trainer, starting January 2, 2012. 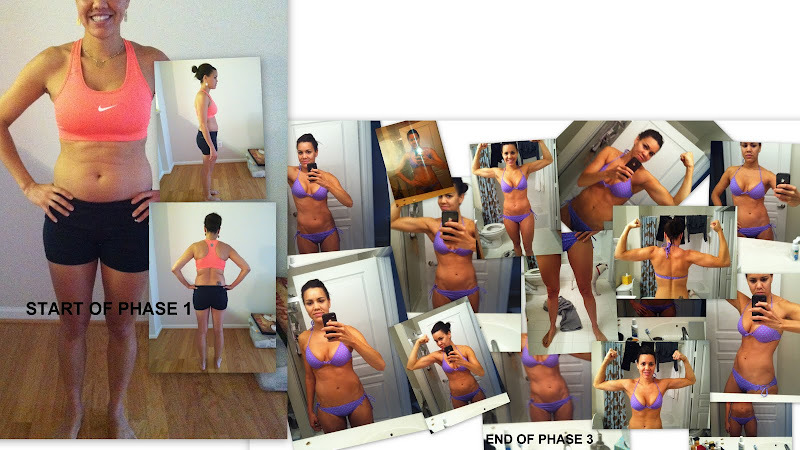 I debated whether if I should start the trainer at the beginning or start from Phase 2. I decided to start from the beginning just so I can get my mojo going and start slowly. What is great about the trainer is it sets you up for success. Everything is spelled out for you from A-Z there is no guessing on what exercises to do and what to eat. Each day is planned out for you so there is no guess work. Below are my results the first time around. Not bad, but there is more to be done, especially, after the holidays, UGH! Preparation is KEY! Find a day where you can give yourself a couple of hours to prepare meals for the week, you will thank me! If you have a couple of bad food days, at least make sure you go to the gym everyday. Take progress pics and measurements. If you don’t and you just weigh yourself you may get discouraged. You could be going up on the scale, but you could be losing inches. Muscle weights more then fat people! Do not obsess. I found myself obsessing over everything I ate and it made me unhappy. Just go with the flow and do not over think. There is a light at the end of the tunnel. If you do as you are told on the program you will see the results. I PROMISE! Ohh…how I love Magazine time. Magazines are the inspiration I need to give me that little push every month when I start to go into a slump. There are great articles, new routines, nutrition tips, and inspiring stories to get you back on track. I get a variety of them some, which many times tend to say the same thing. However, each magazine has its own charm and thats why I buy them. What’s your favorite Health Magazine?